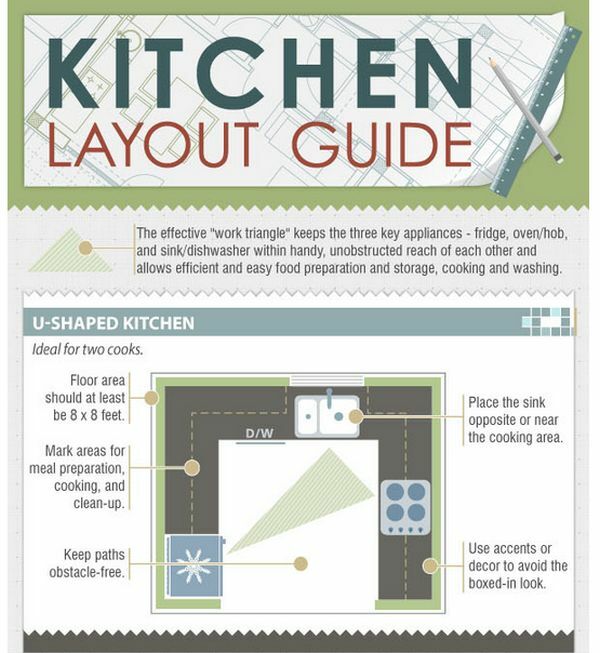 We just spotted this infographic on GlassTileStore.com that helps new home owners pick out a layout for their kitchen and instantly thought of sharing it further. Created in collaboration with Kitchen Cabinet Kings , the drawings below describe the different layout options available, considering the effective work triangle. This basically consists of three key appliances: the fridge, oven, and sink/dishwasher. According to the developers, each of the floor plans gives useful advice on the positions for the work triangle in order to have an efficient and harmonious layout. We find some information in the infographic really valuable, especially in the apartment planning phase. We found out for example that an U-shaped kitchen is ideal for two cooks and should be implemented in a floor area of at least 8X8 feet. Or that gallery layouts are great space savers. Have a look and select the idea that best suits your new kitchen!